Hello, my name is Laurie Beth Tyldesley Pestle. I am a graduate of Clarkson University with a degree in Marketing and Management. I have been involved in the fitness industry for over 10 years! The last 5 years I have predominantly been a Group Fitness Instructor and Small Group Trainer. I’m passionate about creating classes that are fun and allow all fitness levels to achieve a successful workout. My training groups have included strength training for runners; learn to run a 5K, and many others. I am certified by ACE (the American Council on Exercise), ISSA (International Sports Science Association), and American Barre Technique. Currently, I teach Spin Camp Mondays at 9:30 am, Boot Camp Tuesdays at 9 am, Barre at 8:30 am, Boot Camp Express at 5:30 pm and Barre Express at 6 pm on Wednesdays, Barre at 4:30 pm on Thursdays, and Total Sculpt at 9 am on Sundays here at Champions Fitness Center. Starting October 1st I will be teaching Lifestyle 360 on Mondays at 5:30 am and on Wednesdays at 5:30 pm. 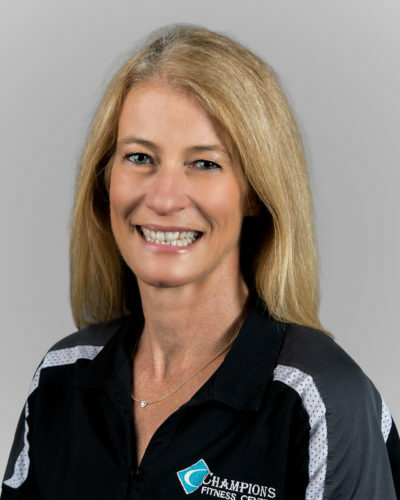 Having experienced the pressure of caring for a family and aging parents along with a career, she understands the challenges of making fitness a part of your daily life. She also understands that taking care of yourself physically will assist you in meeting the physical and mental challenges of being in the “sandwich” generation or simply balancing the rigors of life. I look forward to meeting you and working together as a team to create a meaningful fitness plan. Fitness, like life, is a journey and not a destination. My goal is to make it fun, motivating, and rewarding for you along the way!